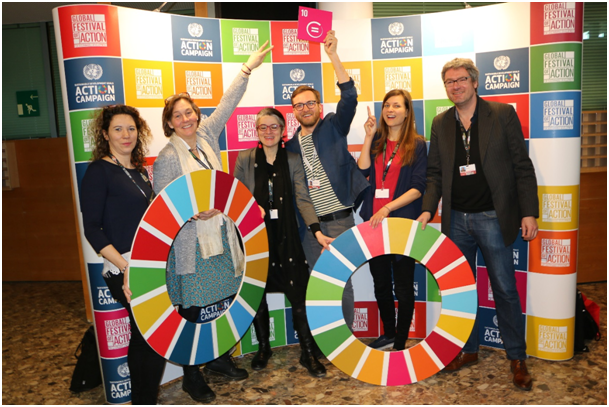 Partner organizations from Germany had the chance to join the SDG Festival in Bonn this year. The annual festival organized by the UN SDG Action Campaign aimed to showcase many actions taken by national, European and international actors to strengthen SDG implementation. According to the organizers, over 1.500 participants participated in over 50 interactive sessions hosted by over 250 speakers. In addition, over 300.000 people followed the festival online. AWO International, WECF Germany and Forum Umwelt & Entwicklung were invited to co-host a session together with several European umbrella organizations. Under the title “From policy to practice: Framing communication of the Sustainable Development Goals in the European Union” the session focused on means, strategies and tools for communicating the SDGs to different target audiences in Europe. Regarding the project’s Inequalities campaign, some of the hands-on, how-to workshops provided us with useful approaches how to plan and implement the campaign by using storytelling, video and “visual voices” to inspire local action for sustainable development. Furthermore, a workshop on power analysis and stakeholder mapping proved to be especially useful for identifying key momentums and target groups to approach, advocating for SDG implementation. Impressive exhibitions of virtual reality settings to reach out to the public or an engaging decent-work game provided further inspiration. Despite the successful opportunity to present the first efforts in our project “Make Europe Sustainable for All” and connect with many partners around the globe, many NGO participants left the 3-day festival with mixed feelings. So far the Festival does not succeed with pairing enthusiastic and creative approaches of many highly motivated stakeholders with real political engagement and commitments. We will encourage questions of (political) responsibility, funding and effective coalition building in next year’s proposal. AWO International was founded in 1998 as a professional association for development cooperation and humanitarian action within the framework of the German welfare organization “Arbeiterwohlfahrt” (AWO, literally: Workers’ Welfare). In cooperation with local partner organizations, AWO International is committed to support marginalized and disadvantaged groups of society to sustainably improve their living conditions. In crisis situations, AWO International, also in cooperation with local non-governmental organizations, quickly provides humanitarian aid to the affected population and supports the rehabilitation and reconstruction process. The head office of AWO International is in Berlin, Germany.